I was very impressed by the presentation of the rice bowls at Pacific Catch; a bowl full of colors and textures. I tried to recreate it today with tofu, roasted vegetables, beet and radish chips, and edamame, adding color and texture to the plate. To give the dish a punch, I pan-fried the tofu in a tangy sauce. It is spicy, sweet, sour, and salty. All-in-one! This recipe is a keeper. Finely chop rosemary and sage. Mix with kosher salt and ground pepper in a small bowl, set aside. Peel and slice beets and radish in (C) with a mandolin into 1/8″ slices. Deep fry beets and radish slices in oil until crispy. Drain and sprinkle the chips with herb and salt mixture while hot. Mix all the ingredients of marinade (A) in a sauce pan and bring to a boil. Lower heat and simmer for ~20 mins uncovered, until sauce starts to thicken. Set aside and let sauce cool. Cook rice (D) per instructions on packaging. Cut tofu into 1/2 inch thick slices. 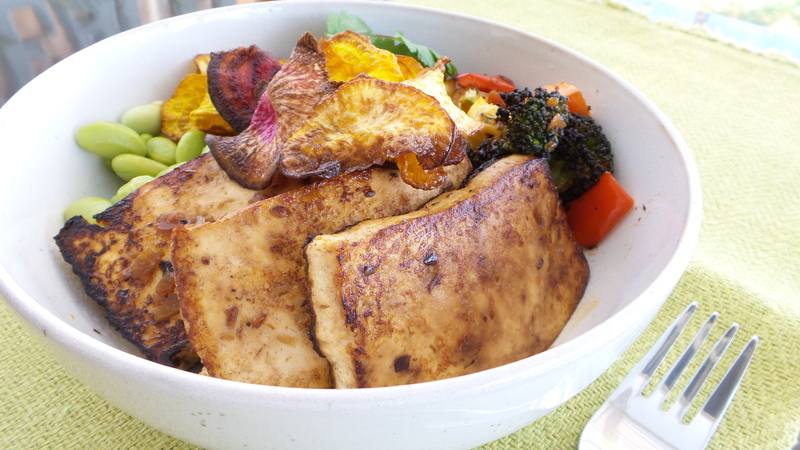 Arrange in a flat base pan/dish and coat both sides of tofu slices with the cooled marinade. Marinade for at least 10 mins. Cut vegetables in (B) into bite size pieces. Marinade and roast vegetables per instructions given in Oven Roasted Vegetables. Boil edamame in 3 cups salted water for 5 mins, drain and set aside. Heat wok over medium-high heat. When wok is hot, add oil and ensure it coats the base of the wok evenly. When oil is hot, arrange seasoned tofu in a single layer in the wok. Allow the tofu to fry for 2 minutes without flipping it, this allows the bottom of the tofu to be browned and seared. Flip the tofu slices over and sear the other side for another two minutes. Bring remaining marinade to a boil again and turn off heat once the sauce boils. 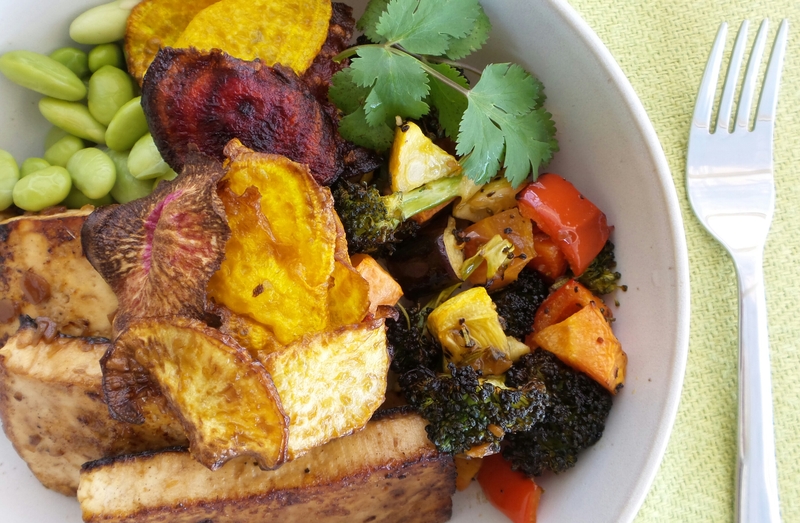 Scoop rice into serving bowl, arrange tofu steak, oven roasted vegetables, edamame, and root vegetable chips over the rice. Drizzle extra sauce over the tofu. Garnish with cilantro.